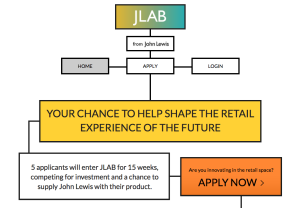 JLAB – the John Lewis Tech Incubator – closed for entries at midnight on the Thursday before Easter and we have just had a chance to look at what’s come in. We are very excited about the amazing amount of interest in JLAB. The number of fully completed applications was 163, with no fewer than 84 being completed in the final two days. I feel this shows how much care, effort and research the applicants have put in, to ensure that their applications resonate with the JLAB selectors. We are rather humbled by such interest and attention to detail. I am pleased to say that the applications range widely, from retail theatre to health monitoring applications. They include social interaction applications and even virtual fashion assistants.